OSWEGO – The harder the effort, the harder the play. Kingsford Park Elementary School fourth graders show off phase 1 of their new playground / city park, which was recently unveiled to the community after a two-year effort. Two years after Kingsford Park Elementary School students helped rally the community behind a need for a new playground, children have again enjoyed recess, this time with more friends, activities and safety. A large group of students who are now fourth graders, advocated then at City Hall for a new playground. Their efforts quickly gained support of Fifth Ward Councilor John Gosek, Mayor Billy Barlow, Oswego City School District administration, the KPS Home and School Association and an abundance of community members. Students utilized skills learned in the classroom and through the district’s Leader in Me initiative to work together toward a common goal and see through it until success was achieved. 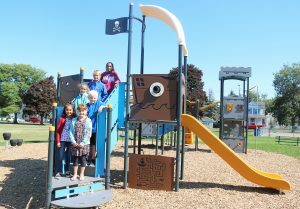 Phase 1 of the playground recently opened served as the initial step to having a well-rounded, versatile playground and city park for both the KPS students and community to enjoy. Julie Chetney, co-president of the HSA, said the playground opening wouldn’t have been possible without the financial support from the city, playground vendor and KPS parents. Phase 2 of the project will include a swing set, multi-spinner merry-go-round, stepping pods and a trekking trail rope bridge; but the HSA needs help in raising $30,000 over the next two years. A third phase would include a toddler playground and multi-sport court but plans to attain these components have yet to be determined. Chipped paint, lack of space and activities to play with, potential littering and safety concerns have been eliminated. Several students suggested community members could help collect Box Tops, each worth 10 cents, to continue the financial support of their efforts. Can and bottle drives and penny challenges were also suggested.